Günter Wilhelm Grass (October 16, 1927 - April 13, 2015) is a Nobel Prize-winning German author and playwright. He was born in the Free City of Danzig (now Gdańsk, Poland). Since 1945, he lived in (the now former) West Germany, but in his fiction he frequently returned to the Danzig of his childhood. Grass is best known for his first novel, The Tin Drum, a key text in European magic realism. His works frequently have a strong (left wing, socialist) political dimension, and Grass has been an active supporter of the Social Democratic Party of Germany. In 2006, Grass caused a controversy with his belated disclosure of Waffen-SS service during the final months of World War II. Günter Grass was born in the Free City of Danzig on October 16, 1927, to Willy Grass (1899-1979), a Protestant ethnic German, and Helene Grass (née Knoff, 1898-1954), a Roman Catholic of Kashubian-Polish origin . Grass was raised a Catholic. His parents had a grocery store with an attached apartment in Danzig-Langfuhr (Gdańsk-Wrzeszcz). He has one sister, who was born in 1930. Grass attended the Danzig Gymnasium Conradinum. He volunteered for submarine service with the Kriegsmarine "to get out of the confinement he felt as a teenager in his parents' house" which he considered—in a very negative way—civic Catholic lower middle class. He was drafted in 1942 into the Reichsarbeitsdienst, and in November 1944 into the Waffen-SS. Grass saw combat with the 10th SS Panzer Division Frundsberg from February 1945 until he was wounded on April 20, 1945 and sent to an American POW camp. In 1946 and 1947 he worked in a mine and received a stonemason's education. For many years he studied sculpture and graphics, first at the Kunstakademie Düsseldorf, then at the Universität der Künste Berlin. He also worked as an author and travelled frequently. He married in 1954 and since 1960 has lived in Berlin as well as part-time in Schleswig-Holstein. Divorced in 1978, he remarried in 1979. From 1983 to 1986 he held the presidency of the Berlin Akademie der Künste (Berlin Academy of Arts). Grass died of a lung infection on April 13, 2015, in a Lübeck hospital at the age of 87. He was buried in a private family observance on April 25 in Behlendorf, 15 miles south of Lübeck, where he had lived since 1995. Grass' literature is commonly categorized as part of the artistic movement of Vergangenheitsbewältigung, roughly translated as "coming to terms with the past." English-speaking readers probably know Grass best as the author of The Tin Drum (Die Blechtrommel), published in 1959 (and subsequently filmed by director Volker Schlöndorff in 1979). It was followed in 1961 by the novella Cat and Mouse (Katz und Maus) and in 1963 by the novel Dog Years (Hundejahre), which together with The Tin Drum form what is known as The Danzig Trilogy. All three works deal with the rise of Nazism and with the war experience in the unique cultural setting of Danzig and the delta of the Vistula River. Dog Years, in many respects a sequel to The Tin Drum, portrays the area's mixed ethnicities and complex historical background in lyrical prose that is highly evocative. In 2002 Grass returned to the forefront of world literature with Crabwalk (Im Krebsgang). This novella, one of whose main characters first appeared in Cat and Mouse, was Grass' most successful work in decades. Grass took an active role in the Social-Democratic (SPD) party, supporting Willy Brandt's election campaign. He criticized left-wing radicals and instead argued in favor of the "snail's pace," as he put it, of democratic reform (Aus dem Tagebuch einer Schnecke). Books containing his speeches and essays were released throughout his career. In the 1980s, he became active in the peace movement, visiting Calcutta for six months. A diary with drawings was published as Zunge zeigen, an allusion to Kali's tongue. During the events leading up to the unification of Germany in 1989-1990, Grass argued for continued separation of the two German states, asserting that a unified Germany would necessarily resume its role as belligerent nation-state. In 2001, Grass proposed the creation of a German-Polish museum for art lost during the War. While the Hague Convention of 1907 requires the return of art that had been evacuated, stolen or seized, this remains a contentious issue between Germany and other countries who charge that some of the (Nazi plunder) has yet to be returned. Thus, Poland and Russia (unlike many countries that have cooperated with Germany) refuse to repatriate some of the looted art. For example, the manuscript of the German national anthem is kept in Poland. 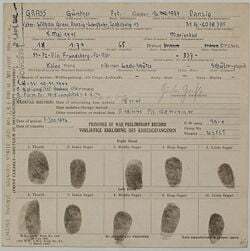 Günter Grass' prisoner of war record, indicating his membership of a Waffen-SS unit. On 12 August, 2006, in an interview about his forthcoming book Peeling the Onion, Grass stated that he had been a member of the Waffen-SS. Before this interview, Grass was seen as someone who had been a typical member of the "Flakhelfer generation," one of those too young to see much fighting or to be involved with the Nazi regime in any way beyond its youth organizations. On August 15, 2006, the online edition of Der Spiegel, Spiegel Online, published three documents from U.S. sources dating from 1946, verifying Grass's Waffen-SS membership..
After an unsuccessful attempt to volunteer for the U-Boat fleet at age 15, Grass was conscripted into the Reichsarbeitsdienst (Reich Labor Service), and was then called up for the Waffen-SS in 1944. At that point of the war, youths could be conscripted into the Waffen-SS instead of the army (Wehrmacht); this was unrelated to membership of the SS proper. It happened as it did to many of my age. We were in the labour service and all at once, a year later, the call-up notice lay on the table. And only when I got to Dresden did I learn it was the Waffen-SS. Grass' legacy is a mixed one. On the one hand, he received dozens of international awards and in 1999 achieved the highest literary honor: the Nobel Prize for Literature, as an author "whose frolicsome black fables portray the forgotten face of history." His first novel, The Tin Drum (1959), is regarded as a key text in European magic realism. Representatives of the City of Bremen joined together to establish the Günter Grass Foundation, with the aim of establishing a centralized collection of his numerous works, especially his many personal readings, videos and films. The Günter Grass House in Lübeck houses exhibitions of his drawings and sculptures, an archive and a library. On the other hand, for many decades Grass was an outspoken left-leaning critic of Germany's treatment of its Nazi past. However, his reputation suffered from the disclosure of his ties to the Waffen SS, from both the political left and right. Grass's biographer Michael Jürgs spoke of the controversy as resulting in "the end of a moral institution." After 60 years, this confession comes a bit too late. I can't understand how someone who for decades set himself up as a moral authority, a rather smug one, could pull this off. Rolf Hochhuth said it was "disgusting" that this same "politically correct" Grass had publicly criticized Helmut Kohl and Ronald Reagan's visit to a military cemetery at Bitburg in 1985, because it also contained graves of Waffen-SS soldiers. In the same vein, the historian Michael Wolffsohn has accused Grass of hypocrisy about not earlier disclosing his SS membership. Also, Christopher Hitchens has pointed out that there have been critics who have called Grass' admission to be merely a publicity stunt to sell more copies of his new book. However, many have come to Grass' defense based upon the fact the Waffen-SS membership was very early in Grass' life, and also precisely because he had always been publicly critical of Germany's Nazi past, unlike many of his conservative critics. For example, novelist John Irving has criticized those who would dismiss the achievements of a lifetime because of a mistake made as a teenager. Lech Wałęsa had initially criticized Grass  for keeping silent about his SS membership for 60 years but in a couple of days had publicly withdrawn his criticism after reading the letter of Grass to the mayor of Gdańsk and admitted that Grass "set the good example for the others." On August 14, 2006, the ruling party of Poland, the "Law and Justice" party, called on Grass to relinquish his honorary citizenship of Gdańsk. Jacek Kurski stated, "It is unacceptable for a city where the first blood was shed, where World War II began, to have a Waffen-SS member as an honorary citizen." However, according to a poll ordered by city's authorities, the vast majority of Gdańsk citizens did not support Kurski's position. The mayor of Gdańsk, Paweł Adamowicz, said that he opposed submitting the affair to the municipal council because it was not for the council to judge history. In September 2006, 46 authors, poets, artists and intellectuals from various Arab countries published a letter of solidarity with Grass, stating that his joining the Waffen-SS was simply a case of a young, misguided teenager doing his duty. The text of the letter made it clear that the authors were not familiar with Grass's works or political views. ↑ Henry and Mary Garland. The Oxford Companion to German Literature. (Oxford Univ. Press, 1997), 302. ↑ "The Literary Encyclopedia," Günter Grass. Retrieved on August 16, 2006. ↑ Von Jens Jessen, "Und Grass wundert sich." Zeit online. (in German) Retrieved April 26, 2015. ↑ Renowned German author Günter Grass dies, aged 87 DW.de, April 13, 2015. Retrieved April 26, 2015. ↑ German author Guenter Grass dies, BBC News, April 13, 2015. Retrieved April 26, 2015. ↑ Richard Lea, Günter Grass, Nobel-winning German novelist, dies aged 87 The Guardian, April 13, 2015. Retrieved April 26, 2015. ↑ Polen stellt sich stur Spiegel online, August 8, 2007 (in German). Retrieved July 8, 2008. ↑ Spiegel interview. (in German) Retrieved July 8, 2008. ↑ Günter Grass, "How I Spent the War: A recruit in the Waffen S.S." The New Yorker, June 4, 2007. Retrieved April 256, 2015. ↑ Guenter Grass served in Waffen SS BBC News. (in English) Retrieved July 8, 2008. ↑ The Nobel Prize in Literature 1999 Nobelprize.org. Retrieved April 29, 2015. ↑ ECHO AUF GRASS' SS-VERGANGENHEIT: "Ende einer moralischen Instanz" August 6, 2006,Spiegel online. (in German) Retrieved July 8, 2008. ↑ John Vinocur, From a Good German, a different kind of story. The New York Times, October 22, 2007. Retrieved April 26, 2015. ↑ Christopher Hitchens, "Snake in the Grass: The pompous, hypocritical hucksterism of Günter Grass." Slate.com. Retrieved April 26, 2015. ↑ John Irving, "Günter Grass is my hero, as a writer and a moral compass" The Guardian August 19, 2006. Retrieved April 26, 2015. ↑ SS-VERGANGENHEIT: Walesa macht Grass Ehrenbürgerwürde streitig. August 13, 2006, Spiegel online. (in German) Retrieved July 8, 2008. ↑ Pie chart. Retrieved April 26, 2015. ↑ Mona Naggar, Arabische Schriftsteller unterstützen Günter Grass (in German) Neue Zürcher Zeitung September 14, 2006. Retrieved April 26, 2015. This page was last modified on 20 July 2017, at 00:11.